The Library has recently acquired access to Moscow News (pub. 1930-2014), which, as described on the database platform, “was the oldest English-language newspaper in Russia and, arguably, the newspaper with the longest democratic history. 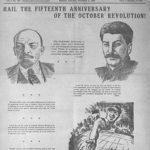 From a mouthpiece of the Communist party to an influential advocate for social and political change, the pages of Moscow News reflect the shifting ideological, political, social and economic currents that have swept through the Soviet Union and Russia in the last century. “The Moscow News Digital Archive contains all obtainable published issues (1930-2014, approx. 60,000 pages), including issues of the newspaper’s short-lived sister publication Moscow Daily News (1932-1938).